I started to read about this topic today, when I saw a FaceBook post by my sister-in-law. She has just finished college and has started to take up her job. She wrote – “There is nothing more depressing to have everything and still be sad…”. My reply was simple – “You got this wrong kiddo”. My thoughts were revolving around needs and necessity and how they impact ones “Happiness Quotient”. But, when I started to read around, I did encounter a better word for the same – Expectations. I am going to quote a website that I came across while I was reading and trying to find out what others might say on this topic. However, Wikipedia has a very interesting way of describing it. An expectation is a mental prediction of what will happen in the future when we don’t know for sure. If what does actually happen matches or exceeds our expectation of it we experience positive emotions such as satisfaction, joy, surprise, or gratification. If, on the other hand, what occurs is different from what we expected or is less than what we expected, we experience negative emotions such as disappointment, anger, or frustration. No matter what I read and where I read, everyone talks about one thing – “Expectations and happiness are inversely proportional”. I am going to use a 4-quadrant matrix to explain how. Let’s spend a few minutes looking at the image below. The first thing that you would have noticed that I have introduced the concept of Resources. I have not really explained that before this depiction, and will do it as we move along. A quick definition as the name itself suggests is “Resource is any physical or virtual entity that can be consumed to obtain benefit from. It can be money, time, or influence over people. Another key aspect of resource is that it is always limited“. Also, a resource sometimes will be within our control and other times not. Like, we expect a raise in Salary, but we do not control it; we expect live happily ever after with our loved ones, but they have their own plans. So, in a way those are also resources that if in our favor are in abundance and other times not in abundance. With definitions taken care of, let’s start looking at each quadrant at a time. I believe that this Quadrant only exists when we are kids. As kids, we do not have many expectations and our resources are limited and dependent on what our parents give us. Also, when I say “kids”, I mean the age of under 5-7. Kids, just want a few things – play, have fun and some toys. If kids get those just enough, they are happy otherwise they are crappy. I call this so, because I don’t think this quadrant actually exists. More resources and not so many expectations is a stage everyone would like to be. This is the only quadrant where one can be in state of happiness and can think of moving towards higher goals in life like spirituality. 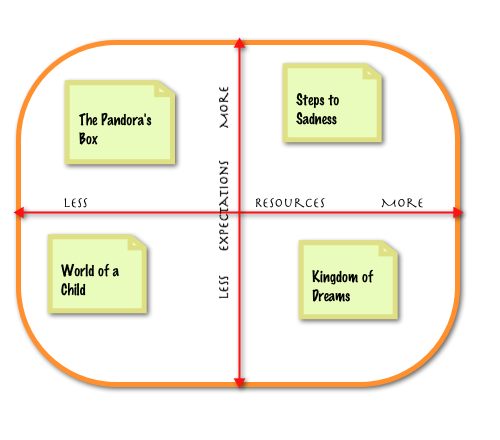 As we grow in life, we move straight into Quadrants 3 or 4. Which quadrant we move into is a matter of how we manage ourselves and our expectations. A lot of it is also dependent on what our society around us teaches us. While Quadrant reflects us that we have adequate resources and same number of expectations, this is not really where we are happy, or not for a long time. This Quadrant is actually a transient phase in our lives and we stay in this Quadrant for very short durations – like birth of our child, a success in career, festivals, family functions etc. Sometimes in our lives we get just enough resources to make ends meet and it is then that we make some of our expectations come true, but as we fulfill that expectation we right away increase our expectations and we go about ensuring we have resources to meet that one too. This is the Quadrant where we spend most time of our lives. We spend time struggling through resources and people and events to make sure we have resources to make our expectations and dreams come true. You would have read in the earlier Quadrant that we can sometimes make some dreams come true, but them immediately our expectations from ourselves and other’s expectations from us increase. How happy we are, is dependent on how successful we are in keeping those expectations close to our resources. Most desperate and sad people are those who actually let their expectations overtake their emotions. It then that we spend our lives in earning resources to make those “dreams” come true. As you may read in some of the related articles, and also in the text above – you may be thinking – “Do we have to lower our expectations to be happy?”. “Do we need to let go our aspirations to be happy?”. I do not say that. All, I say is that you need to know what expectations you have from your life and how you are going to keep up the balance. The more you live your life in the 4th Quadrant, the more dissatisfied you will be in your life. I do not want to infer or plan to let go of all of my goals in life and the good things I want for my family. However, over time, I have started to realize and categorize in which areas do I need to have my expectations run high. And, in which areas do I have to start with a lower set of expectations and hence do not set myself up for a disappointment. It is not easy to do, and all I can say is “Best of Luck!” (and remember there is no such thing as Luck – it is eventually your choice). 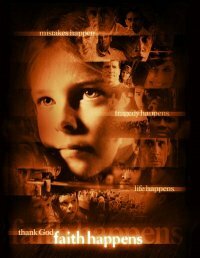 Destiny is seen as a sequence of events that is inevitable and unchangeable. Well this has me confused – It is also said – “you can choose your own destiny”. If Destiny does exists, then no matter what I choose to do throughout my life, all those actions nonetheless lead me to a very predetermined destiny. So where is my free will? So why do I struggle everyday with all those decisions that I make? Why do I even exist as a puppet? Posted on June 8, 2011 July 13, 2011 Categories Brutal Reality, Divine Spirituality, Great ConflictsTags Conflict, Conflicts, Destiny, divine, God, Karma, Philosophy, purpose, Reality, Spirituality2 Comments on Destiny! !